We've finally hit a stretch of warmer weather here in the Wood River Valley, and however haltingly, more trail is starting to open up - buoying the spirits of even this semi-jaded (read: injured) runner. This week I was able to do a recon run of the Vorberg Gulch loop, which starts or ends (depending which direction you run it) with the much discussed Carbonate trail (posts). It's about eight miles with about 1500 vert and for being a stone's throw from town has some truly fabulous and very remote-feeling ridge and singletrack running. If AJW is to be believed (and those of us who know him, know this is rarely), the counter clockwise Vorberg loop seems to have been cut with spring Western States training in mind. While I can't speak to that, I can say that it was really great to get out this week. The knee held up pretty well, even with some quicker descending and some speed work, and getting first spring tracks on bare trail is like no other feeling (see slideshow below). With the knee, though, still far from perfect and my mileage totals in the "recreation/fitness" category, I pulled myself out of the Pocatello 50 yesterday. I'm finally reaching the "acceptance" phase of things, so it wasn't as tough as some previously missed milestones; feelings were more of abstract loss rather than very pointed frustration. It was a great experience to be part of the inaugural Pocatello 50 last year (my 60-second race report). It's one of the special ones on the calendar, and if you're looking to run a hard 50 with some big guns, don't miss it. 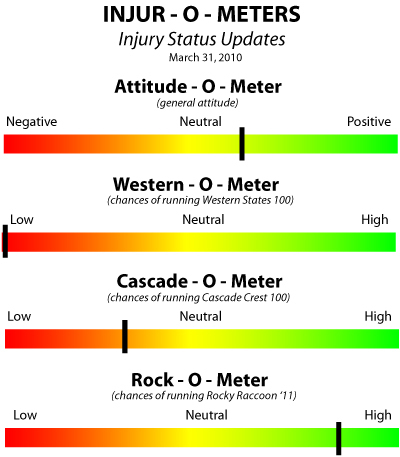 No update to the Injur-o-Meter today (see previous). All things in steady state, poised to move soon, I'm sure.